KATHMANDU, Nepal – On a cool spring day last year, Dorje Lama was playing soccer at the brick kiln where he worked when the ground began to shake. It turned out to be a 7.8 magnitude earthquake, one of the worst in Nepal’s history, which would claim the lives of 9,000 people and lurch Kathmandu 10 feet south. The powerful tremor that stuck on April 25, 2015, forced hundreds of brick kilns across Nepal to shut down, including the one Dorje had labored at since he ran away from family some three years earlier. Destitute and homeless, the 12-year-old boy fled with what few belongings he could salvage and made his way 230 miles west to the Indian border town of Rupaidiha. Dorje wandered the streets for several days before meeting Ali Hasan, the son of a man who ran a mule train. Claiming he was overwrought by Dorje’s story, Mr. Hasan convinced his father to take him in. “He is like a brother to me now,” Hasan says. Hasan and his father brought Dorje back to Nepal – along with 14 older boys and 44 mules – at the start of this year’s brickmaking season. They had been hired to transport bricks at another kiln near Kathmandu. Dorje’s job would be to cook and help load bricks onto the mules for up to 11 hours a day – and less than 20 cents an hour. It was as if the quake had never uprooted him from the life he knew well. Human rights groups see an opportunity to bring pioneering change to one of the world’s most exploitative industries. “I plan to do this the rest of my life,” he says with a sullen gaze as he crouches in the hut he shares with the Hasans and the other boys. Human rights groups patently hope that isn’t the case. In fact, they see in the quake an opportunity to bring pioneering change to one of the world’s most exploitative industries, using the relief aid pouring into Nepal to force kiln operators to stop using child labor. Whether the earthquake will add to the ranks of child laborers or lead to reformation of the brickmaking industry is a question being watched around the world. Developing countries often face similar pressures after natural disasters: amid widespread destruction and the need for quick progress, they must figure out how to hold down reconstruction costs while protecting their most vulnerable people. Those challenges – combined with the chaos fueled by the swelling number of homeless families – afford traffickers and opportunistic employers ideal cover for recruiting children. Forced labor spiked in the aftermath of the Indian Ocean tsunami that devastated Indonesia in 2004 and the earthquake that struck Haiti in 2010. Nepal presents one of the clearest tests yet of whether a natural disaster can be the catalyst for curbing such an entrenched and long-accepted practice. 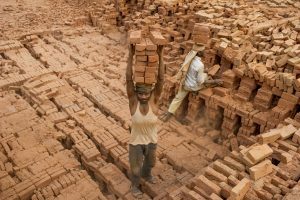 PBS NewsHour special correspondent Fred de Sam Lazaro reports on efforts to end child labor in Nepal’s brick industry. A year after the earthquake, Kathmandu remains filled with heaps of rubble. Tottering buildings are propped up with wooden buttresses. Outside this ramshackle capital, many people still live in temporary shelters made of salvaged wood and corrugated tin sheets. The government estimates the quake destroyed some 600,000 homes and severely damaged 280,000 more across the country. Many of them will be reconstructed with the bricks produced by the nation’s vast network of kilns. Dorje was among the thousands of children who went to work at them once they were fired back up. But the arc of his life would soon change again. The International Labor Organization estimates that 168 million children are in the labor force worldwide. In Nepal, a nation of 28 million people, 1.6 million children between the ages of five and 17 are forced to work – or 21 percent of all children in the country. As many as 60,000 of them work in brick kilns, according to Global Fairness Initiative, a Washington-based international development organization. Many work up to 15 hours a day in dangerous conditions for little to no pay. Dorje was among the thousands of children who went to work at the nation’s kilns once they were fired back up. But the arc of his life would soon change. Mohna Ansari, a commissioner on the National Human Rights Commission of Nepal, says those numbers shot up after last year’s earthquake. An estimated 1 million children were living in the 14 hardest hit districts when it struck. In its post-disaster needs assessment, the Nepalese government warned that vulnerable families faced “disastrous consequences” and that children faced a heightened risk of human trafficking and child labor. The risks are especially acute within the brick industry. As reconstruction gets under way this spring, Jaya Ram Lamichhane, former president of Nepal’s contractor federation, estimates the demand for bricks will double. It’s easy to see why. The quake toppled ancient temples and flattened entire villages. By the time the convulsions stopped, nearly 2 million people were left homeless. Thousands of schools, government offices, and other buildings need to be repaired or replaced. The concern is what the rising demand for bricks will mean for the Dorjes of the world. Labor experts and child rights activists say that unless the industry is reformed, much of the country will be rebuilt on the backs of children. That’s where Mr. Acharya comes in. 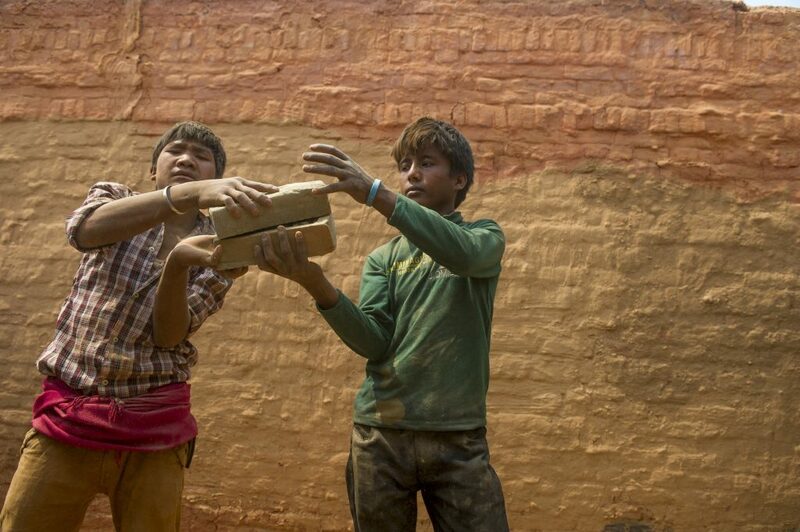 As one of the Nepal’s most prominent anti-child labor advocates, he’s spent the past two years focused almost exclusively on the brick industry. He’s visited more than 200 kilns and met with countless owners, workers, and government officials in his crusade for reform. Better Brick Nepal, a pilot program launched in 2013 with funding from the philanthropic foundation Humanity United, is the culmination of Acharya’s work. The initiative provides technical support to 23 kilns to help them improve their production efficiency and brick quality. In return, the kilns must ban child labor – in addition to bonded and forced labor – and adopt environmental and other workplace reforms. The program’s aim is to create a market preference for ethically sourced bricks. But Acharya, who is the group’s program director, wants to take his work a step further by leveraging the $4.1 billion international donors have pledged for reconstruction. He wants the funds to come with the stipulation that contractors who receive it have to buy their bricks from kilns that don’t employ child laborers. In other words, Acharya doesn’t want Nepal’s worst natural disaster in more than 80 years to go to waste. Acharya is a barrel-chested man with a bald head and well-trimmed beard. He transitions effortlessly between his native Nepalese and fluent English, which he started studying while work as a water-buffalo herder in a dusty village in southwestern Nepal. “If you are working in the fields, then you don’t get to study,” he says. “I choose the water buffalo herding so that I could ride on the buffalo and read.” He’d hold an English-Nepalese dictionary in one hand and in English grammar book in the other, all while making sure the animals didn’t stray into a neighbor’s field. Acharya was studious and imaginative. He dreamed of leaving the village to attend school in Kathmandu. After he turned 16, he sold the water buffalo his grandparents had given him and took a bus to the capital with a sack of rice, a bottle of cooking oil, and about $140. He enrolled in a public college and taught at an elementary school to buy food and cover his rent and tuition. His family sold goats from their herd to help cover his expenses. Five years later, Achayra received a generous scholarship from the University of Colorado at Boulder and moved to the United States, where he lived on and off for the next 17 years. He studied sociology at UC Boulder and got a master’s in international training and education at American University in Washington, D.C. He then took a job as an education policy adviser in the D.C. mayor’s office. It was a formative experience, but Acharya always knew he wanted to return to Nepal. In 2010, he finally did. Acharya’s first pursuit was the country’s tumultuous peace process. He traveled from village to village to encourage reconciliation as the executive director of the Non Resident Nepali Association. As hostilities gave way to a fitful peace, Acharya shifted his focus to child labor. Now he consults with owners and workers and stays on the lookout for child workers. The work is relentless: More than 100 kilns applied to join Better Brick Nepal last year, but the program only had the capacity to sign up an additional 18. Acharya plans to expand it to as many as 40 kilns next year. In the aftermath of the earthquake, Acharya expanded his attention to international development organizations and Nepalese contractors. His aim is to persuade them to give procurement preference to kilns that are certified as child labor free. GoodWeave International, a Washington-based advocacy organization that rescues child laborers and is in charge of the certification, finished inspecting 10 kilns partnered with Better Brick Nepal in early May. Samjhana Pradhan, who heads GoodWeave’s certification division in Kathmandu, says that while her team is still preparing its final report, she has been impressed by the amount of progress made at almost every kiln. “It’s been a good start,” she says. A poster that hangs outside the kiln’s main office spells out the code of conduct. Rule No. 1: No children under 14 years old are allowed to work. The Rakta Kali brick kiln sits on a hill that overlooks green cabbage and cauliflower fields and a meandering river in the district of Dhading. It’s a two-hour drive west of Kathmandu along a steep, two-lane highway that winds past terraced rice paddies and mountain vistas that are often obscured by a thick haze. Dozens of huts, stacks of raw bricks, and mounds of earthen clay dot the hillsides that surround the kiln. The kiln itself is a rectangular brick wall the size of a football field. A 50-foot-tall chimney stands on a raised area at its center. Workers stack raw bricks in 10-foot-high, zigzag rows inside the kiln before covering them with dirt. Then, a group of specially trained men, all from India, insert coarse ground coal in between the bricks through iron chutes. Rakta Kali is one of the 23 kilns partnered with Better Brick Nepal. Acharya’s team helped it set up an early childhood education center and improve its production methods to cut down on waste and pollution. A poster that hangs outside the kiln’s main office spells out the program’s code of conduct. Rule No. 1: No children under 14 years old are allowed to work. But enforcing the policy is a constant struggle. Kiln owners and the families they employ deny that children are forced to work, saying instead that children often want to help in their free time. The people who mold bricks are paid piecemeal, which gives them incentive to recruit their children to make as many as possible. Take the case of Ritika Moktan, a 12-year-old girl with a ponytail and timid smile. When Better Brick Nepal partnered with Rakta Kali in December, the program’s staff helped Ritika enroll in a nearby school. Yet she still helps her parents in the mornings before her class starts. She says she doesn’t mind the work and that she does it in exchange for new clothes. So where should the line be drawn? For Acharya, that’s all that matters. When Nakul Acharya, a local field organizer who is unrelated to Homraj Acharya, admits he hasn’t been telling families explicitly about the zero tolerance policy – instead merely encouraging them to send their children to school – Acharya shoots him a stern look. “If you’re not saying that, you need to,” he tells him. Rakta Kali has shown signs of progress over the past six months. In addition to opening the education center, the kiln has also improved its working conditions and technology. Child labor has been declining, but the kiln has yet to eliminate it completely. That has prevented it from being fast-tracked for certification by GoodWeave. Homraj Acharya remains confident that the kiln will get there. Mahendra Bahadur Chitrakar, president of the Federation of Nepal Brick Industries, bounces his right leg as he sits in his office on the western outskirts of Kathmandu. Piles of rubble are scattered outside, conspicuous reminders of all that the city has left to rebuild; the government estimates some 12 billion bricks will be required. With its 600 affiliated kilns, the federation is a key partner. Mr. Chitrakar insists visitors would be hard pressed to find children working at any of them. He says the federation has threatened to revoke a few memberships in response to reports of child labor – he didn’t give an exact number – but that it hasn’t needed to follow through. According to him, a firm warning is all it takes for a member kiln to make changes. 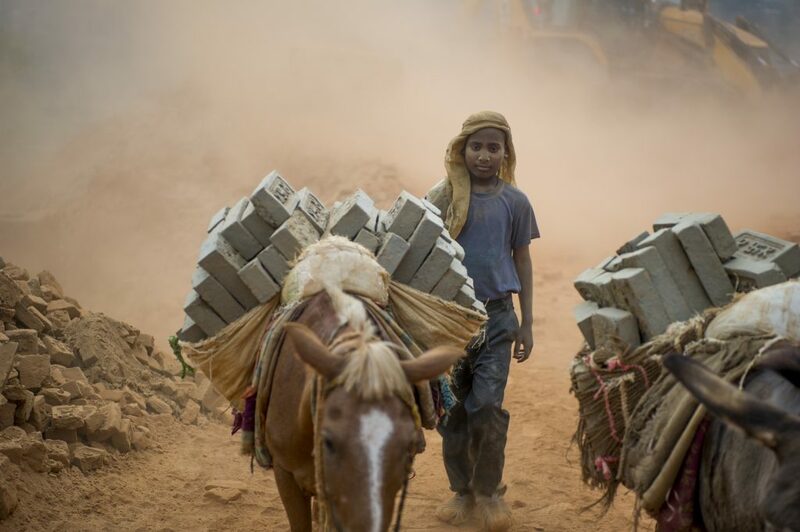 The federation has, consequently, refused to partner with Better Brick Nepal as long as the program requires independent child labor inspections. The federation’s rebuff is just one of the many obstacles Archarya has run into over the past two years. Another has been governmental limitations. Uday Gupta, an undersecretary at the Ministry of Labor, says a shortage of resources has prevented the government from collecting even basic data and hampered its capacity to monitor kilns. Jose Assalino, director of the International Labor Organization’s office in Kathmandu, says the lack of reliable information makes him skeptical of any program that claims to have the solution to eliminating child labor. Even the most well-intended programs run the risk of simply driving children to work in other industries. Still, Archarya has found a growing base of supporters since the earthquake. The Federation of Contractors’ Association of Nepal has pledged to follow up on an agreement it signed in 2014 with the Global Fairness Initiative that gives procurement preference to kilns that don’t use child and bonded labor. The agreement was sidelined after the quake hit six months later, but the partnered organizations now appear eager to revive it. For now the work is painstaking, often happening kiln by kiln – or even child by child. On the morning of May 3, for example, two inspectors from GoodWeave climbed the steep hill to Rakta Kali in an urgent search for Dorje. A member of Acharya’s team had called the organization the day before to inform them about the young boy. He implored them to act fast and coordinate a rescue. The brickmaking season was coming to an end, at which time Dorje would likely return to India with the Hasans. There was no way of knowing what would happen to him next. Dorje was guiding mules saddled with bricks when the inspectors found him. The inspectors, along with two other children’s rights advocates who arrived soon after, told him they had come to take him to a shelter near Kathmandu. Neither the Hasans nor the kiln owner on site objected; they told the inspectors they wanted Dorje to have a chance at a better life. Dorje left the kiln with only the clothes he was wearing and 300 rupees (about $3) in his pocket. It was all he had. 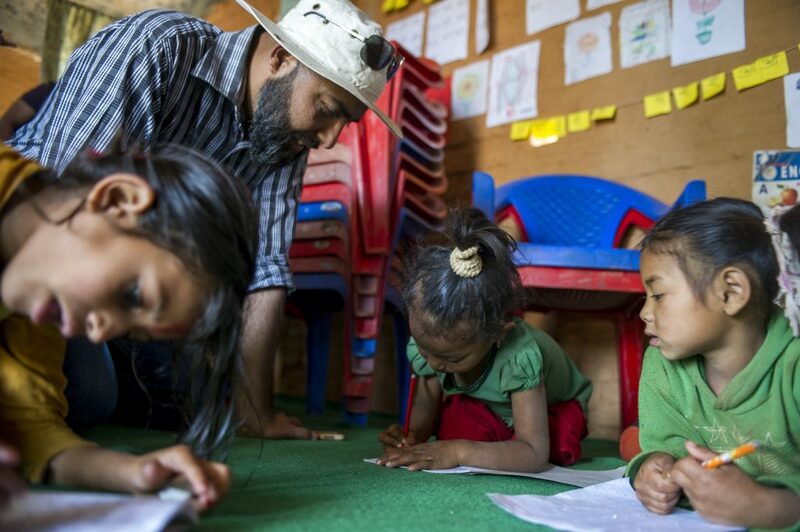 Two weeks later, Dorje was in a classroom at the GoodWeave shelter practicing the English alphabet in a workbook. He had changed out of his dust-coated green T-shirt and black track pants and into a white button-down shirt and white pants. His teacher says he’s a slow student but that he seems eager to learn – matching a description by kiln workers who know him as a “clever boy,” street smart and resourceful. Dorje says he’s happy at the shelter. He’s already made friends, most of whom are children rescued from carpet factories. Together they play soccer and watch cartoons. Soon after he arrived, he received treatment for a fracture in his left forearm that he had suffered years ago but that had failed to mend properly. While Dorje sometimes misses the sense of family provided by the Hasans and remains uncertain about his future, he’s grateful to be out of the kiln. “It is better here,” he says with a smile. Perhaps what most drives Acharya in his campaign to end child labor is his ability to see himself in boys like Dorje. Acharya has worked hard to get to where he is today, but he also acknowledges how fortunate he’s been. His hope is to provide children with the same opportunities he was given. This story was funded by the Pulitzer Center on Crisis Reporting and done in collaboration with the PBS NewsHour. Prem Dhakal contributed reporting.